We continue our journey through “Temptation Island” this week with two more podcast guests, including our first “single” from the show. Katheryn Golden, the blonde who was John’s overnight date joins us first to talk about her journey and she has plenty to say. I knew Katheryn would be fun to talk to but even she exceeded my expectations. She certainly has no filter and doesn’t hold back in expressing her views, which is refreshing. She is up first, and then she’s followed by Nicole Tutewohl, who recorded with me while on a vacation in Maui of all places, where TI was filmed. Since we had Karl on last week, figured it’d be best to have Nicole on this week. Nicole gives her side of things, which in all honesty, pretty much matched up a lot with what Karl said. However, Nicole does fill us in on what really happened during their breakup at the final bonfire which is something I don’t think any of us knew. 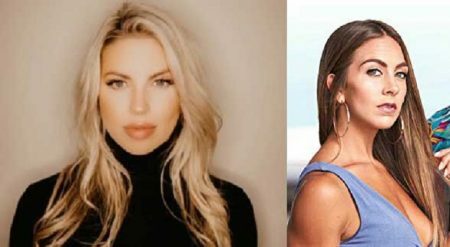 As always, if you want to reply to the interviews, please include Katheryn and Nicole’s Twitter handles (@Katheryn_Golden & @Nicolekayfit) in your replies. Two great interviews lasting over two hours total, so sit back, relax, grab some popcorn and enjoy. Katheryn joins me to talk about her life before “Temptation Island” (3:55), the reality show she was on before (5:48), how she was cast on TI (10:46), her bizarre journey on the show having never gotten a date until the very end (19:07), was she off limits to other guys bc of John (25:22), her fight with Morgan in episode 2 (27:04), did guys share their bonfire stories every time (36:53), her relationship with John on the show (42:57), Kady’s treatment of John (46:19), her fall out with Morgan post-show (51:54), John’s final bonfire (1:01:51), would she ever do this show as a couple (1:06:51), and her “Bachelorette” connection this season (1:08:56). Then Nicole joins me from Hawaii (1:20:38), and talks about if she was hesitant to do the show (1:22:28), what the boundaries were that she set with Karl (1:27:35), why did she feel she wasn’t in love with him anymore (1:31:54), what did she think their problems were pre-show (1:35:02), was she surprised at anything she saw on bonfire videos (1:40:29), the “surface level” comments she made about their relationship and why she said it (1:43:24), her connection with Tyler (1:45:10), the final bonfire and reveals what really happened as part of their breakup (1:48:05), what happened post-show with Tyler (1:54:38), and was it difficult for her to promote the show knowing they’d broken up (1:59:44). -They are currently in Latvia filming episode 6 and 9 guys remain: Dustin Kendrick, Tyler Cameron, Connor Saeli, Luke Parker, Garrett Powell, Dylan Barbour, Mike Johnson, Jed Wyatt, and Peter Weber. -They are staying at the Pullman Hotel in Riga, Latvia. -Yesterday’s group date they were seen in the central market in the capital of Riga. Tyler, Connor, Luke, Dylan, Mike, Jed, and Dustin were on the date, meaning Garrett and Peter have the 1-on-1’s this week. One of them went bungee jumping in the town of Sigulda. The other 1-on-1 will be today. -Since there was no 2-on-1 date in Rhode Island (ep 4), Scotland (ep 5), and Latvia (ep 6), pretty much confirms we won’t have a traditional 2-on-1 date this season since next week is the last week before hometowns, and they usually don’t do one then. There will be a group date that might end up down to 2 guys and she chooses one, but the traditional 2-on-1 date between two contestants who normally don’t like each other isn’t happening this season. -“Bachelor in Paradise” has a premiere date of July 29th, meaning that would put Hannah’s finale the week before on July 22nd. Knowing her season starts May 13th, this looks to be a regular 11 episode season with no double episode weeks. I have some more stuff to give you coming next week about some things you aren’t aware of yet that happened earlier in the season. I think you may be mildly surprised at some things. And, per usual, there is someone there who might’ve ghosted a girl he was dating and broke up with her right when he was called to LA for final casting weekend. Seems like that’s pretty much the norm nowadays. Katheryn was a hoot. I liked the way she just says what she feels, and is unapologetic. Part of me hopes that things develop between her and John. Long distance relationships are hard, but they are really cute together and John deserves someone who actually likes him for who he is.